Direct debits can be a great way to avoid missing payments and incurring interest, but they can also prove costly when set-up blindly, ignored or forgotten. Every year, customers across the UK find themselves overcharged, overstretched and paying for services they don't even use anymore, all because they didn't keep an eye on their direct debits. To help you avoid the trap of overpayments, take a look at our top tips. There may be specific habits that can help you avoid direct debit pitfalls, but there is really no substitute for keeping track of your monthly finances. Having a clear idea of how much is going into and coming out of your account and when it will happen, can avoid overcharging, forgotten payments and help to spot fraud. It might seem tricky if you have lots of accounts, but there are tools that can consolidate all of your financial data into a single, easy-to-use interface. Money Dashboard's free money management software provides a clear breakdown of your spending, and extrapolates trends, tables and graphs to give a true view of your finances. 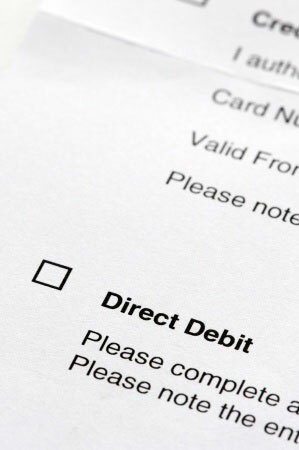 Some service providers encourage direct debit payments. For example, TalkTalk has a £4.50 monthly charge for users who don't pay by direct debit. But don't assume direct debits always offer the best deal. Paying for insurance this way can add eye-watering interest payments to your total cost. The Independent found that Asda was charging 28.6% for the privilege - that's a hefty premium for monthly payments. When looking for a new provider, whether it's telecoms, utilities or finance, remember to use our free price comparison tool to compare deals thoroughly and fairly. And always check a company's payment policy before signing up for a direct debit. Last year, The Telegraph reported that nearly 50% of Britons had overpaid for their utility bills thanks to neglected direct debits, with overpayments resulting in a £970 million windfall for suppliers. Making sure you're charged the correct amount for gas and electricity usage is a simple matter of checking and submitting meter readings every month. As well as ensuring you only pay for what you use, knowing how much your supplier charges will make it easier to compare deals in a fair way if you do decide to switch. When you cancel a service, make sure to cancel your direct debit too. Although many companies do stop them at their end, they are not duty bound to do so. That means you may end up paying for a service you thought had been cancelled. And once the funds leave your account, they can be difficult to retrieve. Research published by MSN Money estimates that 2.68 million people in the UK have lost money on unwanted or cancelled services because of forgotten direct debits. Don't be one of them. It's not only the direct debit recipient who can profit from your neglect either. If you don't make sure you have sufficient credit in your bank account when a direct debit leaves each month, your bank may charge an 'unplanned overdraft fee'. So it pays to organise the timing of your finances, too.